Winter or hibernal solstice is an astronomical occurrence marking the shortest day and the longest night of the year. You know this as the December solstice in the Northern Hemisphere and the June Solstice in the Southern Hemisphere (also known as the Winter Solstice). This happens when the axial tilt of Earth and gyroscopic affects its every day rotation,which means that the two opposite points in the sky to which the Earth's axis of rotation points to its axial precession and changes very slowly making a complete roundabout every twenty six years. As the Earth follows its orbit around the Sun (the polar hemisphere that faces away from the Sun)experiences winter. In half a year it will then face towards the Sun and experience summer. This is because the two hemispheres face opposite directions along Earth's axis, and so as one polar hemisphere experiences winter, the other experiences summer. The winter solstice is considered by some to mark the end of autumn and the start of winter. 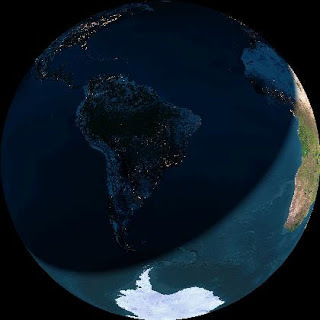 More apparent from high latitude, a hemisphere's winter solstice occurs on the shortest day and longest night of the year which is when the sun's daily maximum elevation in the sky is at its lowest. The winter solstice itself lasts only a moment in time, so other terms are used for the day on which it occurs, such as "midwinter", or the "shortest day". It is often considered the "extreme of winter" Dongzhi in the Chinese calendar. 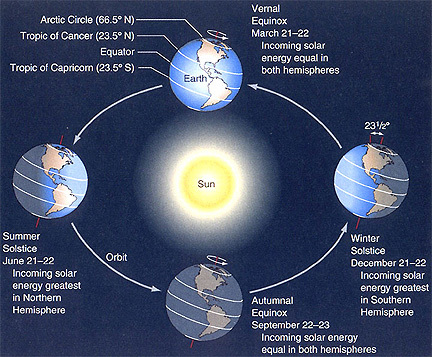 In meteorology, winter in the Northern Hemisphere spans the entire period of December through February. The seasonal consequence of the winter solstice is in the turnaround of the gradual expansion of nights and restriction of days. The earliest sunset and latest sunrise dates differ from winter solsticehowever, and these depend on latitudedue to the difference in the solar day throughout the year caused by the Earth's elliptical orbit to see earliest and latest sunrise and sunset. Worldwideinterpretation of the event has varied across cultures, but many have held recognition of rebirth which involves holidays, festivals, gatherings, rituals or other celebrations around that time. The solstice may have been anextraordinary moment of the annual cycle for some cultures even during the Neolithic times, thesowing of crops and the monitoring of winter reserves of food which many cultural mythologies and customs are derived. This is attested by physical remains in the layouts of late Neolithic and Bronze Age archaeological sites such as Stonehenge in England and Newgrange in Ireland. The main axes of both of these monuments seem to have been carefully aligned on a sight-line pointing to the winter solstice sunrise Newgrange and the winter solstice sunset Stonehenge. It is significant that at Stonehenge the Great Trinitron was erected outwards from the middle of the memorial, i.e. its flat face was bowed towards the midwinter Sun. The winter solstice was hugelysignificant because the people were reasonably dependent on monitoring the progress of the seasons. Starvation was common during the first months of the winter (January to April in the northern hemisphere or July to October in thesouthern hemisphere), also known as "the famine months". In moderate climates, the midwinter festival was the last feast partybefore deep winters began. The majority ofthe cattle were slaughtered so they would not have to be fed during the winter, making it almost the only time of year when a plentiful supply of fresh meat was available. The majority of wine and beer made during the year was finally fermented and ready for drinking at this time. The attentiveness of the observances were not always on the day commencing at midnight or at dawn, but at the beginning of the pagan day, which in many cultures fell on the previous eve.Since the event was seen as the reversal of the Sun's ebbing presence in the sky, the concept of the birth or renaissance of sun gods have been common and, in cultures which used cyclic calendars based on the winter solstice, the "year as reborn" was celebrated with reference to life-death-rebirth deities or "new beginnings" such as Hogmanay's Redding, a New Year oftraditions. In addition "reversal" is another frequent subject, as in Saturnalia's slave and master reversals.